AUSTIN (KXAN) — Three IndyCar racers stepped out from behind the wheel to spend some quality time with young patients at the Dell Children's Medical Center Thursday morning. "As a pediatric cardiologist, I have been trained to do a lot of work to make kids' heart problems go away, but the other part that is really important is just kids feeling well," said Dr. William Pinsky, Founder and President of Racing For Kids. "Having racecar drivers come to hang out with them takes them out of their hospital routine." 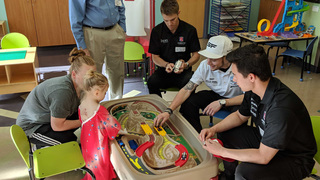 Indy Lights racers Oliver Askew and Robert Megennis, along with IndyCar racer Santino Ferrucci met with patients at the Dell Children's Medical Center, playing with them, answering their questions about racing and generally brightening their day. "It's really special, not many people get to drive race cars and this has been my dream since I was a little kid, and I am really lucky to have this opportunity," said racer Robert Megennis. "It is really nice to share the love and spread it with people who aren't as fortunate as I am." The racers were also joined by president of the iRex Group Matthew Ache who made a $1,500 donation to the hospital through Racing for Kids. The racers' visit comes before a weekend of races, and the first time IndyCar racing has come to the Circuit of the Americas. AUSTIN (KXAN) — On Tuesday, the House approved a bill that will allow farmers to grow hemp and also legalizes hemp products in Texas. House Bill 1325, authored by Rep. Tracy King, D- Batesville, allows farmers to grow hemp as industrial crops under a regulated state program. Additionally, it will legalize hemp-derived products like CBD oil. The debate over whether hemp and marijuana are the same thing have kept such bills from passing previously. Unlike marijuana, hemp and its by-products contain less than .3 percent of THC, which produces the "high" in marijuana. The bill passed by a voice vote and will need to be voted through once more before it heads to the Senate.